Whether or not to move an organization’s technology infrastructure to the cloud appears to be more of a question of “when” to begin the move; not a question of “if” it makes sense to make the move. Take Digital Transformation as an example, though spoken as a single phrase, is by no means a singular event; in fact, transitioning to the cloud is phase-worthy, hugely complex, and typically spread over a couple of years of diverse disruptions due the enormity of the move. While IT resources shoulder a great deal of disruption inherent in core infrastructure transition, the greater disruption occurs within the diversity of operational workforce performance within the organization’s dynamic learning performance ecosystem. These five moments of need frame an agile solution design methodology capable of addressing the entirety of a dynamic learning performance ecosystem. Make note that the last three moments are not based upon Training but frame the context of where they enable performance – Point-of-Work. This is a tactical disruption stressing the limits of traditional training design and delivery. Notice in Figure 1 that Moments 1 & 2 align best with Point-of-Entry during Training while we see Moments 3, 4 & 5 align with workflows at Point-of-Work. Training traditions are in line for disruption as well due to convergence of learning with work. In Figure 1, Point-of-Entry shows alignment with Moments 1 & 2, and that alignment is accurate. What is not so apparent is WHAT is “learned” and HOW it is “delivered” in Moments 1 & 2. The process of learning and the assets used to ensure learning cannot remain separate from the assets and technology utilized at Point-of-Work. For all intents and purposes, we must integrate Point-of-Work into Point-of-Entry Training to preserve continuity of a seamless, frictionless and ubiquitous experience. 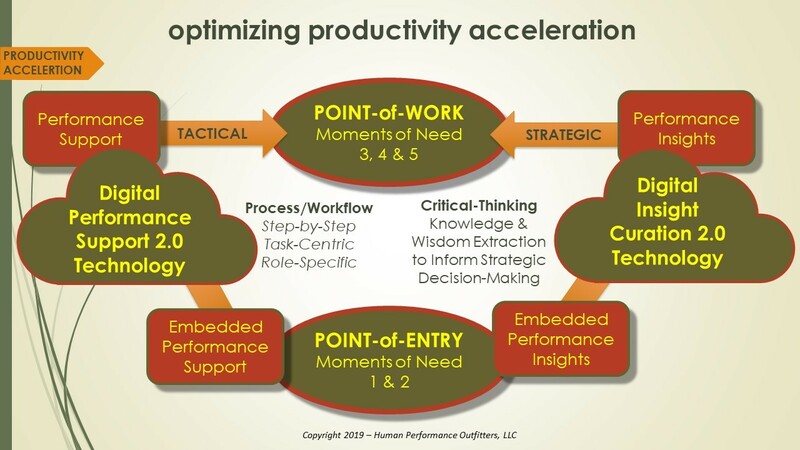 While Point-of-Entry is our first opportunity to introduce Point-of-Work Productivity Acceleration Technology into formal scenario-based training activities, critical Moments 3, 4 & 5 at Point-of-Work represent where hard-dollar business value generation, growth, and/or protection is on the line. Point-of-Work is where we seek full adoption, and the changes to workflow applications become critical to the bottom-line…and disruptive. Notice in Figure 1 there are “Tactical” aspects of the Moments supported by Performance Support assets to optimize “speed-to-impact”, and there are “Strategic” aspects that enable extraction of knowledge and wisdom to optimize “speed-to-insight” used to produce actionable insights. Two different Productivity Acceleration Technologies are used at Point-of-Work, both handling what legacy LMS and even newer LXP platforms cannot deliver within the context of the workflow within two clicks or ten seconds. Cloud-based Digital Performance Support (DPS) technology handles access to tactical, step-by-step instructions specific to task-centric, role-specific activity synchronized (via context sensitivity) within systems and/or process workflows; hence, two-clicks or ten seconds. Cloud-based Insight Curation Platforms (ICP) handle the more strategic needs to enable capture, indexing and sharing of actionable insights essential for critical-thinking and informed decision-making. All disruptions discussed so far are outcomes of decisions made to adopt transformational changes; some more disruptive than others. These decisions must be made in the context of strategy and tactics embedded across the current state learning performance ecosystem. Ground zero in the ecosystem is not a single entity and is represented multiple times at the micro-system level. The technology may have singular functions, but the assets designed and delivered via the technology must be specific to the Learning Performance Continuum represented by the unique requirements of the micro-system pursued. Finance & Accounting, for example will have different Point-of-Entry to Point-of-Work requirements from Distribution & Logistics. This means each micro-system needs a discreet assessment. The Strategist plays the role of a GPS in many respects. When we use a GPS the first thing we do is plug in the destination, right? The first thing the GPS does is calculate point of origin to plot the path to the point of destination. The L&D Strategist armed with PWA methodology performs a similar function – they first establish point of origin (benchmark of current state of readiness and identified challenges to performance) before collaborating with the stakeholder to review findings and prioritize strategy to pursue point of destination (solutions to achieve future state of sustained adoption) and that usually means another dose of disruptive change to status quo Training solutions. Instructional Systems Design – ISD continues to happen but WHAT is designed follows a Create-Once-Use-Many-Times theme. Remember, we want to introduce Point-of-Work assets via Productivity Acceleration Technology during Point-of-Entry. The key disruption to ISD is a matter of the intent behind the solutions created; I prefer to call it Intentional Design. What is intentional is shaped by the Moments of Need to be resolved in the workflow at Point-of-Work. These evolved design tactics cause asset solutions to shrink and drives a new solution descriptive of Just Enough – Just in Time – Just for Me. For example, if we create a Job Aid to support a specific work process at Moment 3 – APPLY, then that very same Job Aid should be embedded within formal Training at either of Moments 1 or 2 or both…and accessed during training using the same Productivity Acceleration Technology in place to serve Point-of-Work. Given the limits of Level 1 and Level 2 evaluations extracted from Point-of-Entry, the only evidence of impact we can prove is learner satisfaction, and transfer of knowledge. No learner has performed in any way to produce performance impact, so we can only point to POTENTIAL as the documented outcome from Training. On the other hand, Performance outcomes measurable at Level 3 and Level 4 only manifest at Point-of-Work. Without completing a PWA the relevant Key Performance Indicators (KPIs) may not be known or confirmed as accepted or viable evidence of performance impact. End-user engagement represents an important measure that confirms speed-to-adoption and is often more difficult to measure. A solid indicator of engagement can be derived from utilization analytics. Utilization almost exclusively happens at Point-of-Work and Productivity Acceleration Technology (DPS & ICP) both produce utilization analytics through integrated performance dashboards. Additionally, both are API capable and compatible with Experience API (xAPI) Learning Record Stores (LRSs) making performance and utilization analytics easily accessible. Yes, another disruption to what we measure; how we measure it; why we measure it; and what we can now do with the results. As far as disruptive change goes, I think we (L&D) have a couple choices – go after it head on…or react to it when it shows up…and it will show up…and it just might be terminally disruptive. After three corporate downsizing events in the last seven years, I have seen the danger of being reactive. Being in successful roles in three top-drawer L&D organizations, we were exposed as very busy silos classified as cost centers. We were clearly seen as a non-contributing expense. When decisions are made to cut costs and reduce expenses, reduction-in-force candidates are not exempted based upon how busy they are; bring nothing to the bottom-line and your department/team are expendable. If L&D has a prayer of moving beyond “expense” status, we need to establish visibility as a source of measurable value contribution to the bottom-line. This means we need evidence of impact, and that means we need to routinely derive evaluation metrics at Levels 3 & 4. Hopefully you can see that the only place we find this kind of evidence is Point-of-Work. Our field of play has shifted closer to…if not converged directly into…Point-of-Work. This shift has disruption written all over it. Rules of engagement are being disrupted by increasing velocity of business demand and continuous change. If the rules change, so too must our game plan, and adoption of a Point-of-Work Solution Discipline represents a new game plan. The discipline delivers proactive disruption to move our base of operations and our solution engagements to where they directly affect the bottom-line and produce a solid value proposition for L&D. Please consider joining the LinkedIn Group – Point-of-Work Solution Discipline – You’ll need to register to join, but this is a free networking group. Join us! ← Old Dog with New Tricks?